We have a few sources for traditional, hand-made, brain-tanned, smoked moose hide from the Cree in Canada. The moose hides on this page are handmade using traditional methods but were not treated with brains. Traditionally, the hides would be tanned using brains before stretching and smoking. Nowadays, it is rare for brains to be used and each person has their own recipe for softening the hides. Traditional, hand-made leather is very difficult to obtain these days and has become quite expensive. Each piece is cataloged and priced separately. 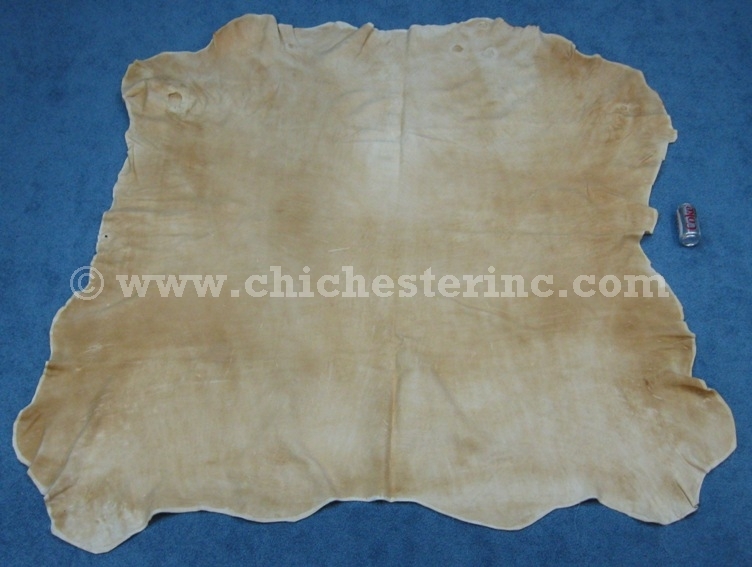 The price varies by the quality of the hide, thickness, color, and suppleness. Sometimes we also get brain-tanned, handmade, white moosehide (i.e., hides that have been prepared in the traditional way, but not smoked). To see a gallery of pictures showing a hide being smoked in Quebec, click HERE. Our Gxx codes denote individual smoked moosehides. If you would like to order a specific moosehide, please go to our Gallery to pick the exact one shown.